NYX Can't Stop Won't Stop Foundation was hyped up quite a bit before it's launch, so even though I've had great experiences with NYX in the past, I was cautiously optimistic. 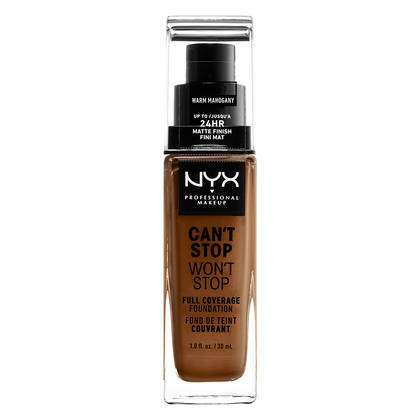 Once I got my Can't Stop Won't Stop (in shade Warm Mahogany 16.7, shown above) and tried it I knew this would be one of the most used foundations in my collection. 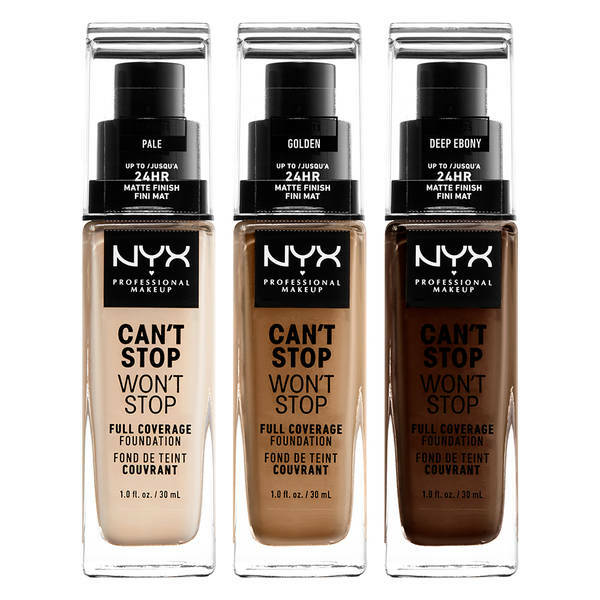 For those of you who have used NYX or other drugstore foundations, you will be amazed by the range of this line. NYX took the smart step of teaming up with YouTube beauty vlogger Alissa Ashley and advocate for diversity to develop the extensive shade range. She helped mix current shades and add different undertones to get those in-between shades. 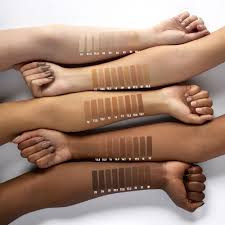 There are 45 shades, with an equal amount of choices for fair, medium, deep and dark skin tones. These shades are similar but not identical to the shades in their other foundation ranges, so you will get the best shade matching by either calling them and describing to their consultants other foundation shades you use, or visiting a NYX store for color matching. When I applied just one layer of Can't Stop Won't Stop all unevenness and dark spots disappeared. My skin was instantly even and the feel was completely weightless on my skin. It was easy to blend and on days I didn't need extra coverage, I simply used an additional thin layer under my eyes as a stand in for concealer. The foundation set quickly and there was no transfer or smudging on to my fingers or clothes. During the day is where Can't Stop Won't Stop really impressed me with how matte it kept my zone, without it looking too dry or cakey. On an average day I was inside and outside and it was warm, I only had to blot once in the late afternoon, and it was a very light blot at that. Even though this delivers oil control and a natural matte finish, I would say any skin type could get great results with it. Note: If you have very dry skin, I would recommend using a hydrating primer first. Speaking of primer, I did get great results using this with their Can't Stop Won't Stop Matte Primer ( I found that I got even more oil control this way), but I have to say even without a primer at all I still had long wear and very impressive application. If it was a very hot/humid day, I did finish my makeup a mattifying makeup setting spray, but again, even without one my foundation lasted longer and looked more matte than almost any other I've tried lately. I also got the best results applying the foundation with a foundation brush, and using a small beauty blender for use under the eye to additional blending. At the end of the day I used a makeup remover or wipes and then a second cleansing with a gel or cream cleanser to remove all the foundation (so it really did stay on for a full day! ),.This just took an extra few seconds and was well worth how great my makeup looked all day!